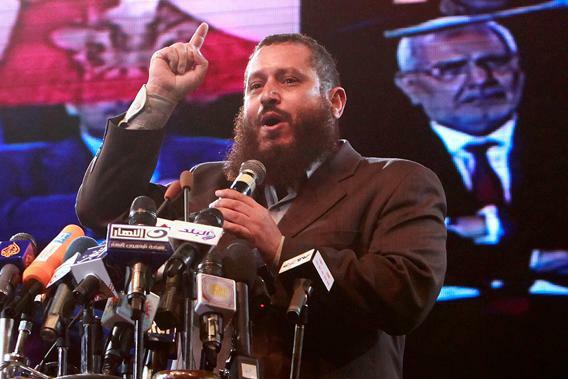 Emad Abdel Ghafour heads Egypt’s Watan Party: The Salafist leader who advises Mohamed Morsi. An interview with Emad Abdel Ghafour, the leader of the new Egyptian Salafist party Watan. Emad Abdel Ghafour speaks during a rally in Cairo on May 18, 2012. Lally Weymouth: You were a member of Egypt’s Salafist Nour Party. Recently, you broke off and founded the Watan Party. Could you explain why you broke away from Nour and what Watan stands for? Emad Abdel Ghafour: I am the founder of the Nour Party, and I was the main [force pushing] the Salafists to enter politics. They traditionally refused to participate in political activity before the revolution. They did not want to participate in the revolution. I participated and made my followers participate. Then later, after the revolution, I came up with the idea of starting a political party. The Salafist movement totally refused. They were afraid to enter into politics. I convinced them, and we participated in the election, and our Nour Party had a spectacular showing that no one had anticipated. After the results came out, Salafists wanted to limit membership in Nour to Salafists only. I wanted to open the party to all people. This issue and these problems continued for about a year, and we didn’t reach agreement. L.W. : So you broke off and started Watan? E.A.G. : That was the vision of a big group which split with us from the Nour Party and joined Watan. L.W. : When did you found Watan? L.W. : You are also an adviser to President Morsi? E.A.G. : I am an assistant to President Morsi. My official title is presidential assistant for social outreach. There are three official assistants to the president, and I am one of them. L.W. : Do you think President Morsi has been a disappointment in his first year? His poll numbers are down. E.A.G. : My understanding is that any president who would come to power was going to face huge problems in the first year in power. The performance of President Morsi is not at 100 percent, but it is not disappointing. I would say it is an above-average performance. L.W. : The Watan Party has an alliance with the Muslim Brotherhood, correct? E.A.G. : Actually no, not at all. L.W. : The Muslim Brotherhood has said favorable things about you. E.A.G. : In general, I have good relations with the Brotherhood and with the Wafd Party, which is a right-wing party. I am well-liked by all the forces. My differences with them are political, and they don’t reach the degree that we would be bad-mouthing each other. L.W. : If you were to become president of Egypt tomorrow, how would your vision be different from President Morsi’s vision? E.A.G. : President Morsi should open the way for all parties to share responsibility and not only keep it for the Brotherhood. Just more inclusion—declare fully and actually that he is the president for all Egyptians. The main problem is that a lot of Egyptians do not feel that he is a president for all Egyptians. L.W. : Would you like to see Islamic law imposed? E.A.G. : I totally believe that all laws should have a full public consensus, especially when it comes to laws related to Islamic sharia. L.W. : Does that mean you want to see Islamic sharia imposed? E.A.G. : I would definitely like to see sharia law, and this is a major demand for the Egyptian people. You had all the 13 candidates for the presidency during the last election saying they would apply sharia, so there is a consensus. L.W. : What about the treatment of women? Would you give them equal rights? E.A.G. : In the current constitution, Egyptian women have all the rights from education, work, ownership—everything. And that’s the fact on the ground. I don’t believe in coercing anyone to do something they do not agree to. Even my own daughters, I cannot force them into anything. L.W. : Is it true the Watan Party has an alliance with Gamaa Islamiya, which is considered a terrorist organization by the United States and Europe? E.A.G. : We don’t have any political alliances right now. We might have an election coalition, but there is a difference between an election coalition and a political coalition. An election coalition is only for the election period; a political coalition continues after that. L.W. : Did you have a shared alliance with Gamaa Islamiya? E.A.G. : No, we don’t have any alliance with them. L.W. : Will you align with them in the next election? E.A.G. : We have major differences in ideology. For example, they were recently calling for a committee to secure the streets, and we categorically refused and believe that this is the job of the police and the military. We see that this populist committee could be a seed for a militia, and that could be a dangerous thing. L.W. : Would you like to see the United States release Sheik Omar Abdel Rahman [the “blind sheik”]? E.A.G. : He is now under the authority of the Americans, and it is up to the Americans to release him or not. But if America did actually release him, this would be highly appreciated, and the popularity of America would increase in the region. There are some actions you can take that would save you billions of dollars, and this could be one of them. L.W. : How could releasing him save the U.S. billions of dollars? L.W. : Are you in favor of upholding the Camp David Accords? E.A.G. : Camp David exists, we respect and deal with that. There are some issues with the Camp David treaty that might need renegotiation. E.A.G. : The security situation in the Sinai needs to be re-looked at, and there are other issues that need to be renegotiated in the accords. I recently met with former President [Jimmy] Carter, and he mentioned to me that in the Camp David Accord, there is self-determination for the Palestinians. That needs to be reactivated. L.W. : The Salafists have criticized President Morsi for reaching out to Iran. How do you feel about it? E.A.G. : This is not the Salafists—this is the Nour Party. L.W. : The group you used to belong to. Do you share that view? E.A.G. : They don’t criticize him for communicating with Iran. They criticize him for bringing the Shiites to Egypt. They are afraid that Egypt will turn into a Shiite crescent. L.W. : You fear Egypt will turn into a Shiite state? E.A.G. : Yes, that they will come as tourists but will convert Egyptians into Shiites. We should have political and economic relations with Iran. The problem is that we are afraid of having groups inside Egypt that have allegiances not to Egypt but to Iran. L.W. : I thought the Salafists hated the Shiites. E.A.G. : With the Shia, there are certain ideas that are a deviation from Islam, and we hate these ideas. L.W. : Recently some Egyptian soldiers were captured in the Sinai. Didn’t the group that seized the soldiers demand that the government release Salafists to get the soldiers back? You were in the president’s office. What happened? E.A.G. : No. The problem is that during President Hosni Mubarak’s time, the treatment of the Sinai people was extremely harsh. They would go, for example, to arrest a drug dealer and not find him, so they would arrest the whole family. They would fabricate cases against them. There are now about 700 convicted Sinai people. They have been demanding—and I have been the mediator—that the president give them amnesty from the crimes they were convicted of. The president says he cannot give amnesty but he can give a fair retrial. But they want full amnesty. In this last incident, they demanded the release of 18 prisoners. There was pressure from the military and … when they felt surrounded [by the military], they released the soldiers. I’ve been going to Sinai for a year now. There have been many mediations as to whether we can provide services to the people of Sinai, like redeveloping land to help them have a better lifestyle. We try to improve their conditions so they won’t feel forgotten by the state. L.W. : I understand that when President Morsi makes a decision, he consults senior members of the Muslim Brotherhood. Is that correct? E.A.G. : No. There is a group that is close to the president. Let’s call it a crisis-management group. There are specialized groups for different issues. For example, from an economic point of view, I truly believe he trusts Mr. Hassan Malek and Mr. Khairat el-Shater. L.W. : Does President Morsi make decisions by taking orders? E.A.G. : I totally disagree with that. I don’t think so. I know he is an educated man, President Morsi, and he is very independent. He reads most of the reports he receives, and in my discussions with him I’ve found him aware of all the issues. L.W. : What do you think is going to happen in Syria? E.A.G. : The issue in Syria is very complicated and different from the situation in Egypt post–Arab Spring. The problem in Syria is that there is not a strong mediator between [the regime and the opposition] to stop the violence and convince each side that it is their interest to stop the violence. We need a strong mediator in the middle. L.W. : How do you feel about the United States? E.A.G. : We consider the American people our friends. L.W. : What about the American government? E.A.G. : Of course we have a lot of negative comments about some of the actions of the American government. E.A.G. : Sometimes the actions are against the will of the people in this region and sometimes even against the will of the American people. L.W. : I don’t understand the problem with the U.S. government—it helped to overthrow Mubarak. E.A.G. : It’s not just about Mubarak. For example, the U.S. is withdrawing from Afghanistan in 2014, and they should do that but also give the Afghan people a way to decide their future. The drone war and using drones for killing—a lot of people consider this a crime. There are so many issues like that that harm the image of the American government. These are important issues America needs to reconsider. L.W. : Supposing the U.S. knows a terrorist is going to strike America; why shouldn’t it strike him with a drone? E.A.G. : Do you know for a fact he’s a terrorist and is going to strike? You are killing on intent, not on actual actions, and this is a problem. If we think like this, we will be killing children while they are in the womb because they might be intending to do something like that. I personally believe in dialogue and finding political solutions and not killing on intent. I truly believe in that. Sooner or later, everyone sits down to debate and discuss.